Finally got to Banchan in Glenview, in the same strip with a three other Korean places (So Dong Gong, Paik's Noodles, Soup Belly) as well as a couple labeled Japanese (Fish on Fire, and Mozu Sushi and Izakaya). They're really close, but they've been only open for dinner (still not sure lunch still is available), and had a lengthy soft opening when they weren't open every evening. The menuincludes more than just fried chicken, including appetizers of pork buns and takoyaki; mains of bibim bap and bull dak; and a caesar salad. But we were there for the chicken. My son and I got a medium combo of 10 wings and 5 drumsticks (boneless strips also available) for $23.95, mix of garlic-soy and spicy. That's a pretty big upcharge from Buffalo Wildwings ($11.50 gets you 18 wings), but they're pretty big wings, cut as drummie and fling+tip (yes, there's a bit of meat on the tip piece). The chicken is cooked perfectly (fried to order): juicy, crisp batter and not-too-sweet glazing. The spicy is certainly more exciting, but perhaps a little one-note; the garlic-soy seems dull at first, but is really very tasty. If it wasn't for the fact that the wings give you more crunch, I'd go straight for the drums which were really flavorful. The included side we chose of pickled radish (slaw, kimchi or rice are the other options) was a little skimpy for a dinner for two -- we should have sprung for a second side, I'm intrigued about their onion rings, if they're battered the same way. The online menu has $8-9 lunch specials, so perhaps they are open for lunch now. Not a bad deal for lunch, with 8 (instead of 10) wings for 4 bucks less. Google says they are only open for lunch on weekends. On a recent trip I ordered a salmon puff (I think that's how it was identified) appetizer. It was thin strips of salmon wrapping a center of very light (almost whipped) avocado. Really nice surprise. Chicken is quite good. The second Chicago outpost of Bonchon, the Korean restaurant that specializes in fried chicken, should open in either late July or August, according to a rep. Its signage is up at 1732 W. Division Street. Bonchon Glenview a few days ago, was surprised how much I liked the chicken. Tender, crunchy with two types of sauce neither of which necessitated a fire hose to clean up after eating unlike, say, the wings at Budacki's. 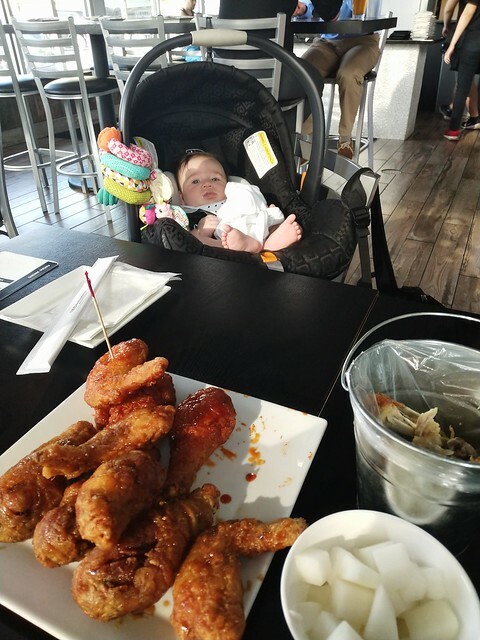 I'm a long time fan of Great Sea, the new style Korean wings I've tried have been ok, nothing I'd crave, though I like Zip's on Howard St as much for the (lack of) ambiance as what's on the plate. Bonchon service was friendly, efficient, restaurant spotless, kimchi funky, diakon crunchy and side of rice filled in the cracks nicely. Bonchon is not going to replace Great Sea but of of the new breed its the best I've encountered. Bonchon Korean wings, count me a fan! The signage has been up for almost a year, but it’s finally wing time in Wicker Park as Bonchon — the Korean chain that opened its first Chicago location last year in Chinatown — will open on Thursday on Division Street. G Wiv wrote: Bonchon is not going to replace Great Sea but of of the new breed its the best I've encountered. Same today, though I'd now include Landbirds with Great Sea to the notgoingtoreplace mix. Glenview Bonchon is now open for lunch weekdays.